This recipe makes a rather new style of cheese. I began with a traditional Alpine style process but introduced a new generation of cultures. If you are familiar with cheeses like Sartori's BellaVitano, or the new generations of cheese like Paradiso, Parrano, or Prima Donna (Yes they all sound like Italian names, but they are all being produced in Northern Europe), then you may be aware of the fact that something very new and exciting is happening in the cheese world. I’ve always felt that modern cheese making should be the best blend of the old ways along with the most recent knowledge that science can provide. So this month I am using one of these new cultures in a hybrid version of a traditional mountain style cheese. 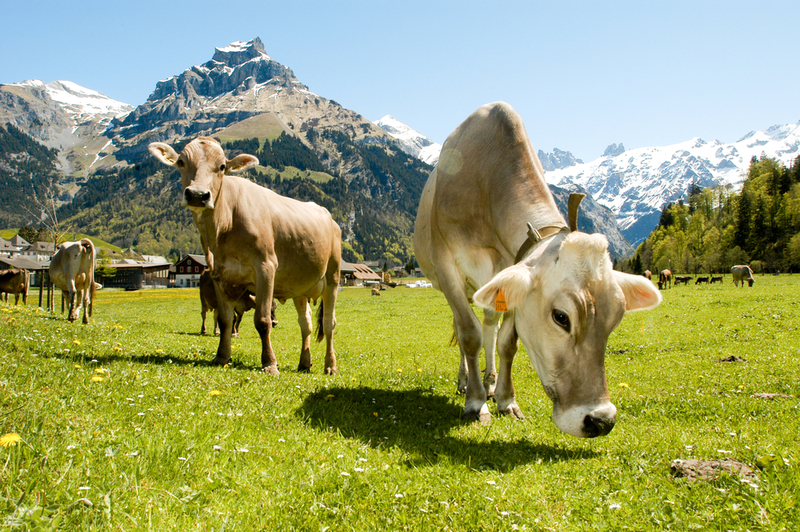 For centuries now, each summer folks would move their milking animals to the mountains for the cooler climate and green grass. In the high Alps (Swiss, French, and Italian) these were long journeys which the animals and men could handle on their own, but the cheese when made had long rough journeys back down to the valley towns where they were sold. 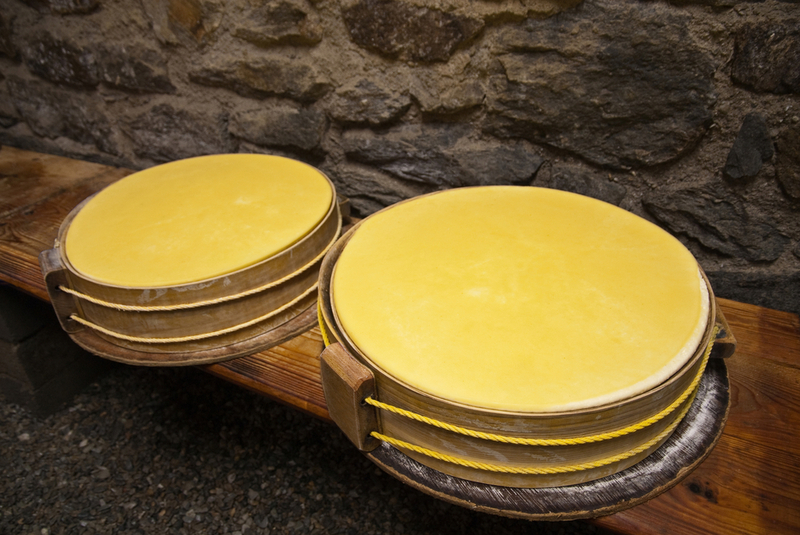 Therefore, the cheeses were made very large and cooked at higher temperatures to make them drier and strong enough to handle the rough travel back to the valley. Also, work on the mountains involved a long tiring day so making one large cheese per day was a much more efficient use of time. Evening milk was stored cool overnight and morning milk added the next day. Today, things are a bit different with roads and trucks being able to get to the Alpage, but the cheese still remain large. This is because one large cheese is much easier to handle during aging than many smaller ones. Perhaps even more importantly, the aging dynamics of aging are different comparing small to large cheeses. For example, in my visits to the Etivaz area in Switzerland, the cheese makers are getting older and prefer to make slightly smaller cheeses for handling, but those responsible for aging in the valley say that the cheese does not age as well as the larger cheese. The big difference seems to be the cheese body to surface area ratio of the larger ones is smaller so less moisture loss which changes the ripening profile over time (a very good thing). The cultures used for these cheese were always of the farm, they had evolved in the milk and buildings over many years until they reached their own balance. This made each farm slightly unique along with the special diversity of each pasture and herd. These same bacteria from the Alps became the study targets of scientists as our knowledge of these microbes increased. Ever since Pasteur's work with bacteria, what has been found on the farm has been brought into the lab, identified, and studied. This is what has increased our understanding of what makes these cheese and how they do it. As time has continued to advance knowledge, the isolation and study of the many bacteria and what they bring to the character of cheese has brought us new tools to work with. First, they carefully incubate the whey from the current cheese vat for the next days cheese and as they do every day throughout the season through. Then they add a minimal dose of a lab based culture provided by the AOC directors. They tell me it's an insurance to prevent problems that would otherwise diminish the regional standards, but they always believe that their own cultures dominate. The research projects have gone even further in the 21st century and some of the new isolates are focused on specific characteristics of the final cheese such as sweetness, savory, and reducing bitterness and sulfur like notes. When looking at these Alpine style mountain cheeses, there are several cultures to be considered as coming from the farm. Propionic another culture coming from the farms and pastures and known for producing the large gas holes depending on process and aging conditions. Bulgaricus a bit uncommon in the mountains but some of the farms do use a yogurt culture. The special addition I am adding for this particular alpine hybrid is of the Helveticus group. 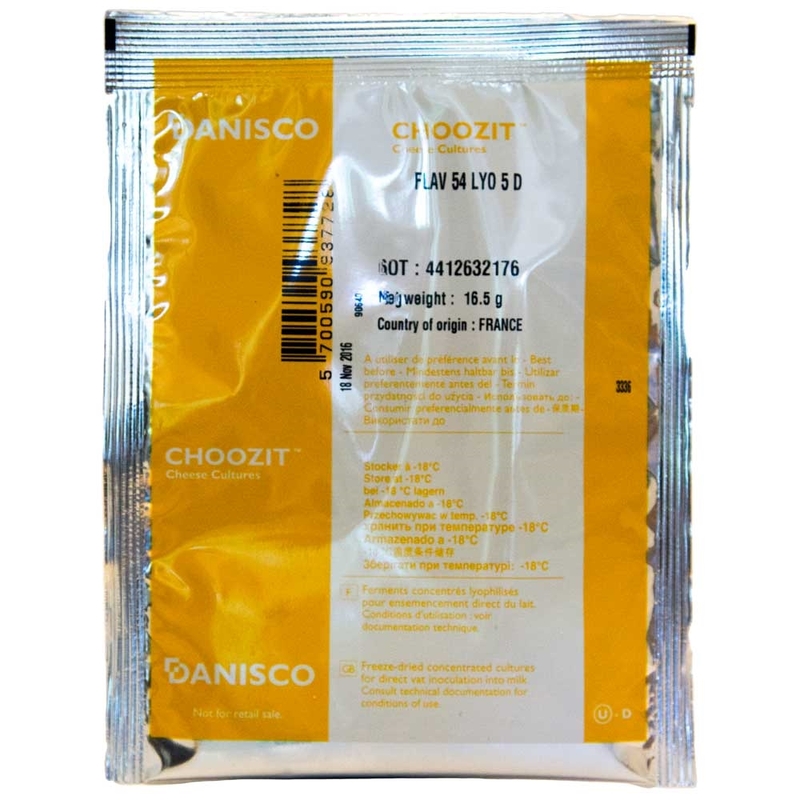 This comes to us as Choozit Flav54 from Danisco/Dupont, and is a special culture developed in the L.helveticus group. Work with this one has been proven to highlight the sweet, nutty and savory notes in cheese. This contribution occurs during the aging as the proteins are reduced. We are using it here this recipe as the Helveticus component when creating our special Alpine hybrid. Flav54 can also be used quite effectively in tandem with Propionic bacteria in recipes that require both. Some cheese makers are also using this effectively in cheddars for a different character.